Giada Gerboni says that robots have adapted their form to create speed and precision. The robotic form can be broken down into rigid links moving around joints, their motion coming from actuators. Current robotics requires a precisely measured environment with precise programming so that robots do not crash into other objects or themselves. In her TED Talk The Incredible Potential of Flexible Soft Robots, Gerboni discusses her work with flexible robotics and controls. Gerboni’s major issue with robot bodies is that their rigidity brings precision and strength but that same quality can also make them dangerous and ineffective. Why can’t a robot be softer than its environment instead of harder? Her argument for soft and functional bodies is the octopus, and shows an octopus on the ocean floor manipulating a coconut shell. Tentacles are soft, flexible, used for mobility and used to perform tasks. An octopus succeeds because it possesses embodied intelligence, allowing it to conform to its environment and deal with surprising variables. Her work with soft robotics seeks to make systems that can face mundane or unexpected situations in the field. Giada Gerboni is a great speaker and this talk shows many examples of soft robotics. My favorite thing that she’s done, however, is a project with a surgery robot. 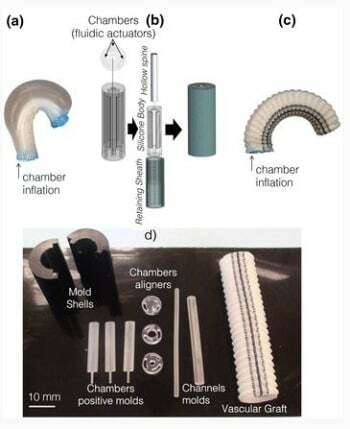 The paper Modular soft mechatronic manipulator for minimally invasive surgery (MIS): overall architecture and development of a fully integrated soft module was published in Meccanica in 2015 and outlines the development and control system of soft surgery robots. 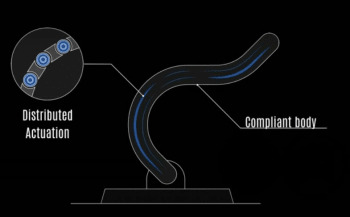 Developing the flexible fluidic actuators (FFA) for the system acted as the base for the surgical robot shown in Gerboni’s talk. A follow-up article detailing the group’s work with cadaver models titled Highly dexterous 2‐module soft robot for intra‐organ navigation in minimally invasive surgery is included in the December 2017 issue of The International Journal of Medical Robotics + Computer Assisted Surgery : MRCAS.